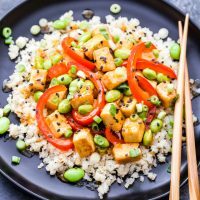 Orange Tofu and Edamame Stir-Fry is perfect for an easy, meatless dinner. 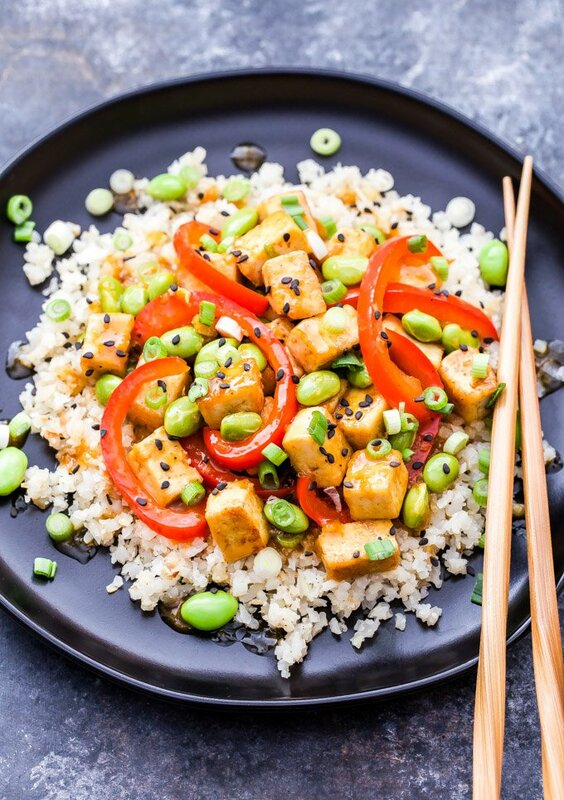 Crisp tofu, sweet red bell peppers and protein packed edamame are coated in a fresh and flavorful orange sauce. 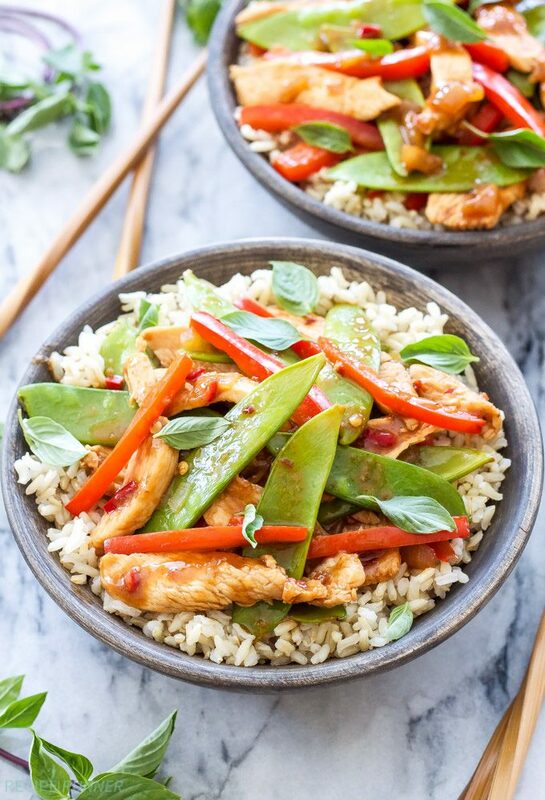 You’ll love this healthy, one pan dinner! Happy Valentine’s Day! Sorry no chocolate on the blog today. I figured you already have all the sweets you need. 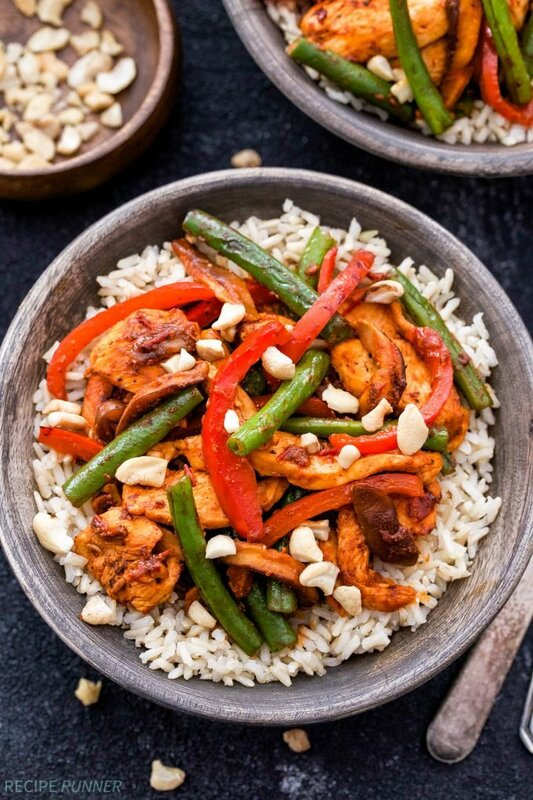 Instead, I’ve got a great recipe for you to make tomorrow to help pull you out of the sugar coma, Orange Tofu and Edamame Stir-Fry. Wait, don’t leave! I know a lot of you have strong feelings about tofu and I’m sure they aren’t all warm and fuzzy. Let’s be honest. When you look at a block of tofu, pretty much nothing about it screams “omg I have to eat this!”. Basically it looks like a big white sponge and if you eat it straight out of the package, that’s about what it tastes like too. When it comes to eating tofu I prefer that mine have a crisp texture like it does in this Sheet Pan Teriyaki Tofu and Broccoli recipe. I absolutely love that recipe, but I wanted to see if I could still achieve a crisp texture without having to bake it. 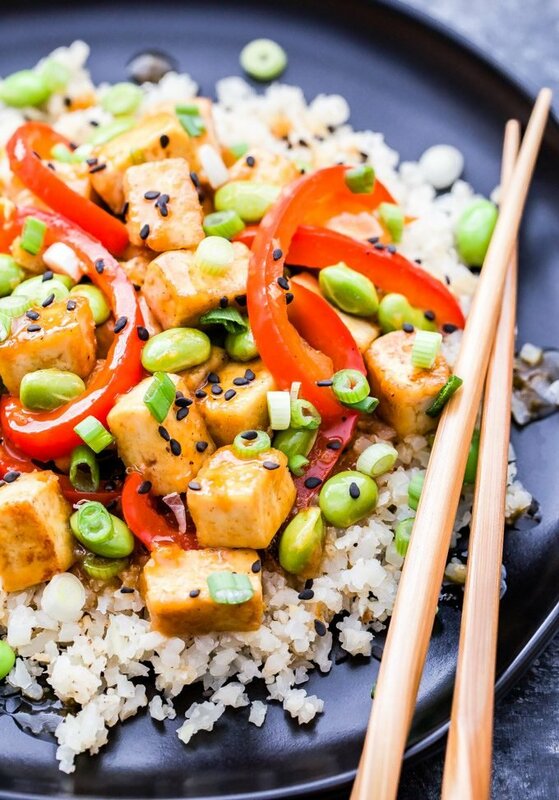 There are a few things you’ll need to do in order to achieve a crisp texture for tofu in a stir-fry. The first is to use extra firm tofu. The second and probably the most crucial step is to press as much of the water out of it as possible. To do this I cut it into slices, wrap them in a clean kitchen towel and set them on a plate. I then pile a couple of my heavy cast iron skillets on top and let all that moisture press out for about an hour. The final step to achieving crisp tofu in the skillet is to let it brown for a couple minutes on each side before moving it around, sort of like you would if you were searing a piece of meat. You’ll know it’s ready to flip when it’s golden and slightly crispy on the exterior. Since it’s citrus season, making an orange sauce seemed like the logical thing to do, plus with how much I love orange chicken, I knew I’d like it on this tofu version. The sauce is sweetened with honey, so if you’re vegan go ahead and sub in maple syrup instead. For the veggie I decided on a red bell pepper and for extra protein, edamame. The sauce uses arrowroot powder for the thickener, cornstarch will work as well. 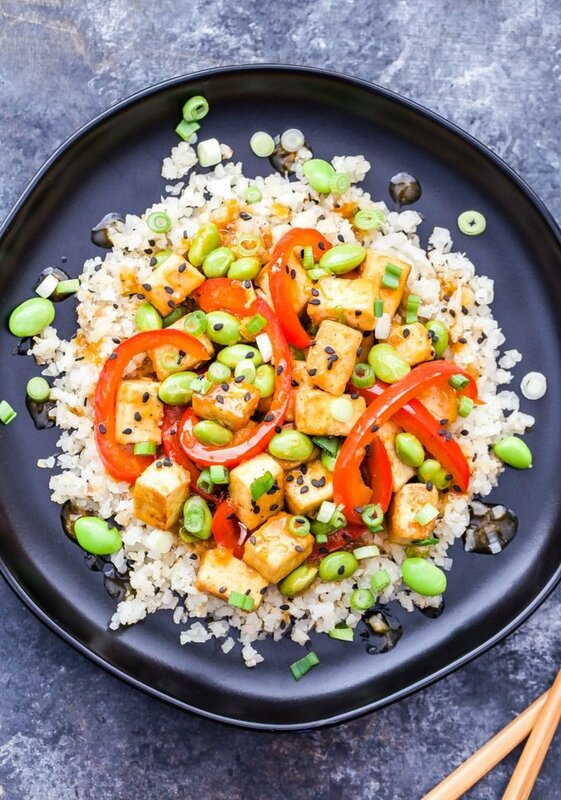 Serve the Orange Tofu and Edamame Stir-Fry over rice, cauliflower rice or even soba noodles! Drain the tofu and pat dry with paper towels. Slice the tofu into 5 slabs. Line a plate with a clean kitchen towel, then arrange the tofu in a single layer on the towel. 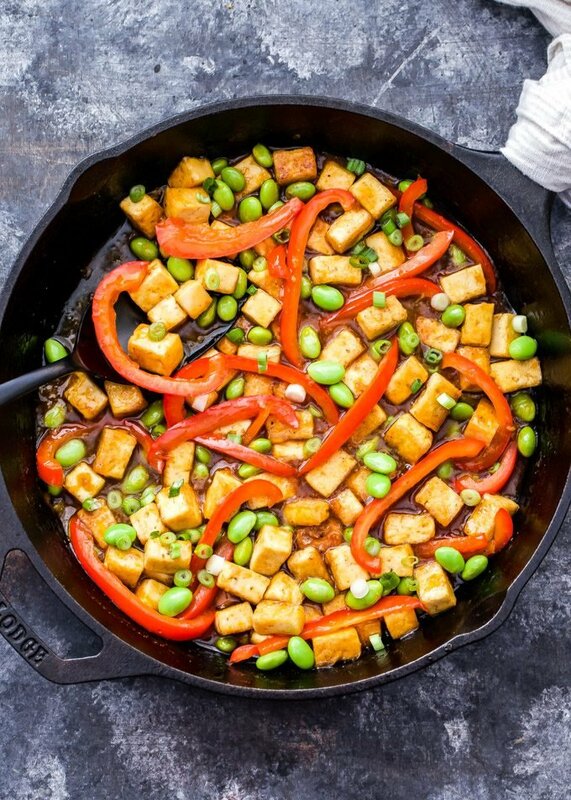 Fold the towel over the cubed tofu and place something heavy on top such as a cast iron skillet. Press the tofu for approximately 1 hour. After an hour, stack the slabs on top of each other and slice through them lengthwise, then slice across to make 5 even rows. You should have 50 cubes of tofu. Remove the towel and season the tofu with salt and pepper. 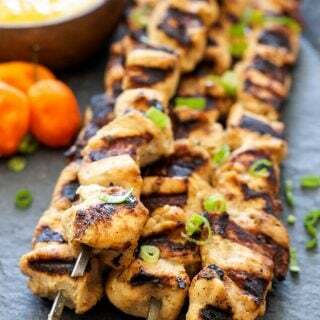 In a small bowl whisk together all of the ingredients for the orange sauce until combined. Set aside. Heat 2 teaspoons of the oil in a large non-stick or cast iron skillet over medium-high heat. Swirl the oil to coat the bottom of the skillet then add in the cubed tofu and arrange into a single layer. Cook on each side for 1-2 minutes or until golden and crisp. Remove the tofu from the skillet back onto the plate. Add the remaining teaspoon of oil to the skillet and swirl to coat the bottom. Add in the red bell pepper, ginger and garlic. Sauté for 1 minute then add the tofu back in along with the edamame and stir everything together. Pour the orange sauce into the skillet and stir until the sauce thickens and everything is coated, about 2-3 minutes. 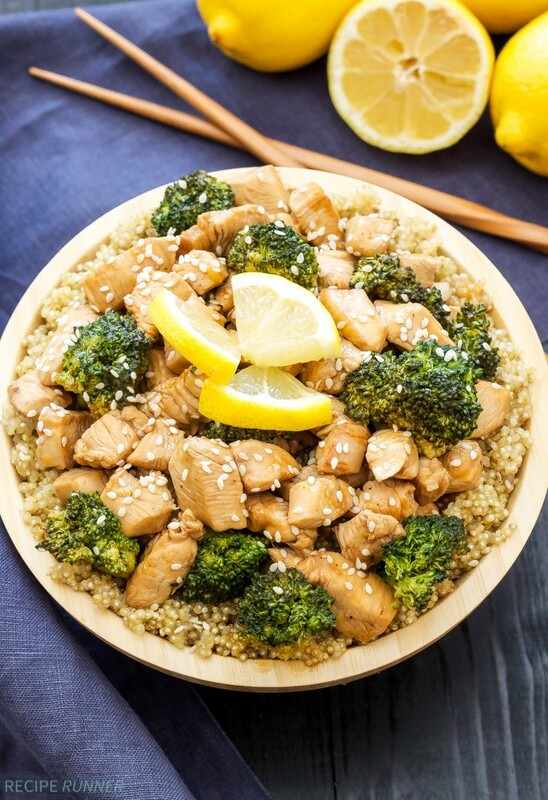 Top with sliced green onions and sesame seeds over rice, cauliflower rice or soba noodles. 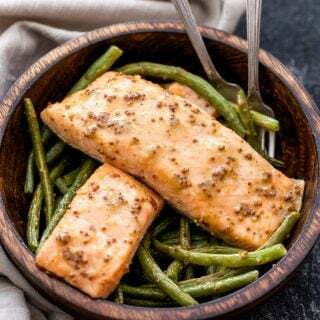 This looks absolutely delicious Danae! I just discovered your blog through a facebook search of running & recipes. 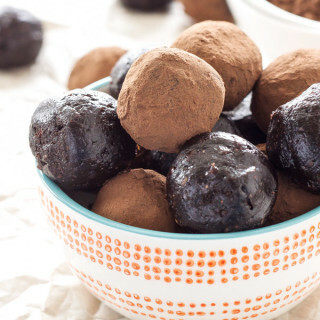 It's so nice to find another runner sharing recipes!